From the moment I heard the song “There Is Darkness, There Is Light”, I knew I would love Corinna Rose. Rose sounds remarkably similar to Halifax’s Gabrielle Papillon (whose voice I have described as “like a warm blanket”) and much of the music on Rose’s debut full-length album Northeast Southwest will melt your heart. This combination of “singer-songwriter” and “banjo player” makes Northeast Southwest a very unique album. In many ways it is almost like two albums in one – one consisting of six singer-songwriter tunes; the other two songs are bluegrass style banjo picking hoe-down tunes. Rose is remarkable playing both styles. Rose, the singer-songwriter, plays music to melt your heart. Through songs like “Lost Like You”, “Mirrors”, “Darcy (D.)”, “Your Light”, and my favourites “Fresher Fruit” and “There Is Darkness, There Is Light”, Rose (like Papillon) makes the listener want to wrap up in a blanket with a hot cup of tea, and enjoy her music. Rose, the banjo player at the hoedown, plays music that makes you want to get up and dance. Both “Northeast Southwest” and “So It Goes” are such songs. The best word to describe these songs is “fun”. Northeast Southwest is the follow-up to Rose’s 2011 self-titled EP. Her song “Green Mountain State” (released between the EP and this album), was featured over the opening credits of Sarah Polley’s film Take This Waltz. 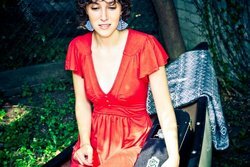 In the last year, Rose has toured extensively and played several music festivals. With the release of Northeast Southwest, Rose is once again on tour. She begins the Maritime leg of the tour on May 8th and lands in Halifax at The Company House on Saturday, May 11th. At The Company House, Rose’s special guests will be Scott Nicks and (the remarkably talented, new Nova Scotia favourite, “see her soon in a small venue while you still have the chance”) Jennah Barry. It promises to be a remarkable night of music. Below, you can play the song “There is Darkness, The Is Light” and watch the video for “So It Goes”. Heard Corinna Rose in Sackville this past week, and loved her music. She is an up and coming Canadian STAR. She is every bit as good and better than a lot of the ones who have made their music and name well known. Canada must get behind this beautiful young lady and allow her to make a decent living doing what she does so well. She is different. She can sing you a soft, gentle song and she can make you want to move. Awesome talent!